I first got to know San Francisco architect Malcolm Davis of Malcolm Davis Architecture when he designed my friend Berry’s house (coincidentally, years earlier I had ripped out one of his projects from a magazine). Among the many highlights of his projects? The bathrooms, which are light, airy, and full of well-considered details. So who better to turn to for advice? 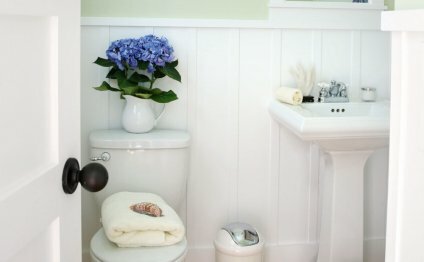 Remodelista: What do your clients typically ask for in a bathroom? Malcolm Davis: When someone comes to me, they usually know what bathrooms I design; there’s always some sense of the outdoors and as much daylight as possible. When clients start looking at imagery, I ask them to think of their house as the best version of what they want it to be and what look will go with that in the bathroom, as opposed to their dream bathroom. I try and have a thread of the rest of the house incorporated in the bathroom so it feels connected. Above: A marble-clad shower with an obscure-glass (frosted) door that opens on to a wooden roof deck and a small window looking onto the trees outside. RM: How do you manage to make your bathrooms so light and airy? MD: If I have any way of getting daylight into the bathroom, I do it. I always try and get a bathroom on an outside wall. In a city, you don’t always get that option, so then I go for a skylight. It’s important to have a visual link to the outdoors; it’s neat to have some clear glimpse of the outside, even if it is just one panel of a window where you can see a tree outside or a skylight where a bird flies overhead. The more light the better. Sunlight is the best killer of mold. If you can make the windows larger that’s the biggest change you can make. RM: What’s your approach to design? MD: I like some bandwidth in the bathroom. It needs to be a place where if you are putting yourself together you can be the most spot on, but it’s also a place where if you feel terrible you can unwind in warm water and find some solace. The bathroom has to provide a good backdrop, and not work against you. It should convey a sense of simplicity and clarity. RM: How do you create a serene backdrop? MD: I use simple, nice materials and work with a limited palette. I really like limestone, marble, and slate. I like to bring in some sense of nature, a piece of natural wood or a Heath tile that has a handmade quality. I use a wood shelf in a lot of bathrooms. If the surfaces feel too hard and shiny, it can feel too perfect. With materials that have a softer organic feel, that’s when the person starts to feel they fit in. MD: A bathroom is going to last for a long time, so I like to keep it simple. It’s not clothing. When it comes to materials, I always question whether it will last for a long time. I advise clients to set out a couple of materials they like and look at them every day before deciding. Often it’s the one that you thought that was boring that works in the end. Above: In this 21st Street project, Davis notes, “I use porches a lot in my mental vocabulary where people may think that this could have been an outdoor space that has been closed”. MD: Industrial-looking Stonco lighting is my go-to. It’s a vapor tight light with a guard and they are great for tucking in a skylight shaft.